I was debating whether to share threadless.com with you - not just because its that good (it is) but also because its my go-to site for last-minute printable gift certificates. Not that I ever forget a birthday gift. Not me. Never. Anyway, threadless.com sells inexpensive graphic t-shirts, hoodies and onsies. That's not the cool part. The cool thing is that all of the graphic designs are submitted by people like you and me. Well, not people like me - talented, witty, design-minded people who create hilarious shirts. The designs are also usually limited, so its rare that you and your neighbour will show up in the same shirt. And yes, gift certificates from threadless make a great gift because you can print them off, and it gives the giftee the fun task of picking their own witty shirt! 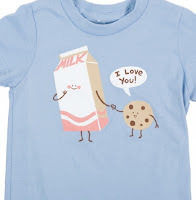 K's a big fan of his dad's Cookie Loves Milk shirt, mostly because he looks at it as a walking menu. "Mmm...Daddy, I need it the cookie!" I'm thinking the Fast Food shirt is out of the question. But, Man, its funny!